This gorgeous room is styled by Rachel Peters. I am instantly drawn to the tall ceilings and the abundance of natural light in this space! The exposed brick walls with the faded plaster is unexpected and charming, a wonderful contrast against the pretty furnishings and decor. The curved silhouettes from the furniture combined with soft whites and muted shades of pink exude a feminine and relaxed look. The floral patterns on the fabrics and accessories reinforce the feminine look even further. 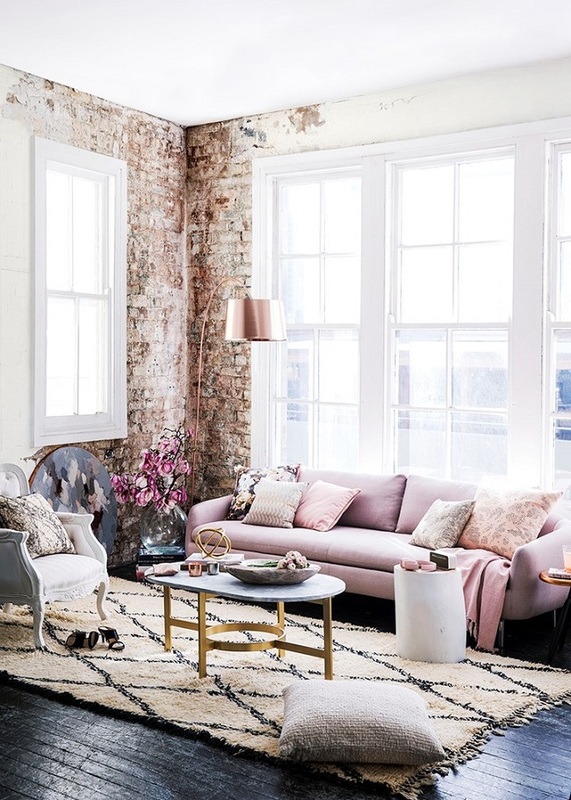 A hint of rose gold and brass accents provide a dose of modern luxe in the space, how chic! There is so much inspirations to be found in this beautiful, effortlessly romantic living room, don't you think? What are your thoughts? Love the mix of textures! The blend of masculine and feminine finishes is fantastic! I love this room!! Any chance I can use this photo for a book cover? Please let me know how i can make this possible! !